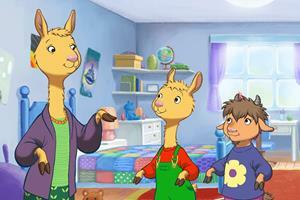 Netflix has renewed LLAMA LLAMA for a 2nd season, starring Jennifer Garner, and Genius Brands International has begun producing the episodes, as well as two half-hour holiday specials for delivery late in 2019. With the excitement associated around the RAINBOW RANGERS upcoming launch November 5th on NICK Jr, we cannot lose sight that we also have a hit series on Netflix in LLAMA LLAMA. Genius Brands International now has two major engines of income generation moving closer to the marketplace with revenues and earnings to be recognized soon in 2019. Netflix has renewed LLAMA LLAMA for a 2nd season, and we have begun producing the episodes, as well as two half-hour holiday specials for delivery late in 2019. Additionally, Monday we announced, that we have secured a round of non-dilutive financing from Bank Leumi to fund the production of the series. JENNIFER GARNER began her voice recordings yesterday in her starring role as Mama Llama. Jennifer is not just a mega movie star, but she is a very special individual who has aligned herself with amazing causes, the likes of Save the Children, where she sits on the board of directors. Her prodigious voice over talents were being recorded yesterday, for the first episodes of the new season, and you can see them in the video link below! The consumer product licensing program for Llama Llama is now under full activation with numerous companies now coming to us for product licenses, as the success of not just the Llama Llama books, but also the animated series on Netflix has been noted. The attached release* speaks to new licensees in Christmas goods and party supplies, coming alongside toys, figures, playsets and plush, branded coloring and activity books, animatronic plush toys, belts, and a full line with Kids Preferred of developmental infantile toys and plush. New products will roll out later this year and throughout 2019. I often speak about ‘billion-dollar brands.' What makes billion-dollar brands in the kids business??? They start with successful content. Once the content is successful either in television, movies, or games, then the consumer products are licensed to come into the children’s marketplace. Strong brands for example, like Strawberry Shortcake and Power Rangers and Ninja Turtles and Pokémon and Sesame Street and Paw Patrol, all became household names. The products generate royalties, and the royalties thus become earnings... many, many millions of dollars of earnings when they hit. When I produced Strawberry Shortcake, we ultimately did over $5 BILLION DOLLARS OF RETAIL SALES. Paw Patrol, currently on Nickelodeon, has been a huge success and the engine behind $1.7 billion dollars of Spin Master revenues this year, fueling their meteoric rise up to a $5 BILLION+ MARKET CAP.